SoftPerfect Network Search Engine is a comprehensive yet user-friendly application that allows you to easily search for specific files or folders on your LAN, returning quick results. An efficient search engine is vital if the full potential of your medium sized corporate network is to be realized. 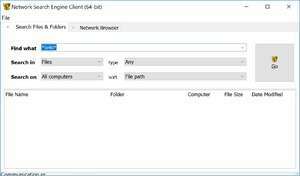 This application is a strong search engine that indexes all shared files in your local area network and provides users with the ability to locate necessary files within a few seconds. SoftPerfect Network Search Engine returns blazing fast search results to your users, even when large numbers of shared files and folders are present. For security reasons, you should also check out the Network Search Engine download at LO4D.com which includes virus and malware tests. Additional screenshots of this application download may be available, too.